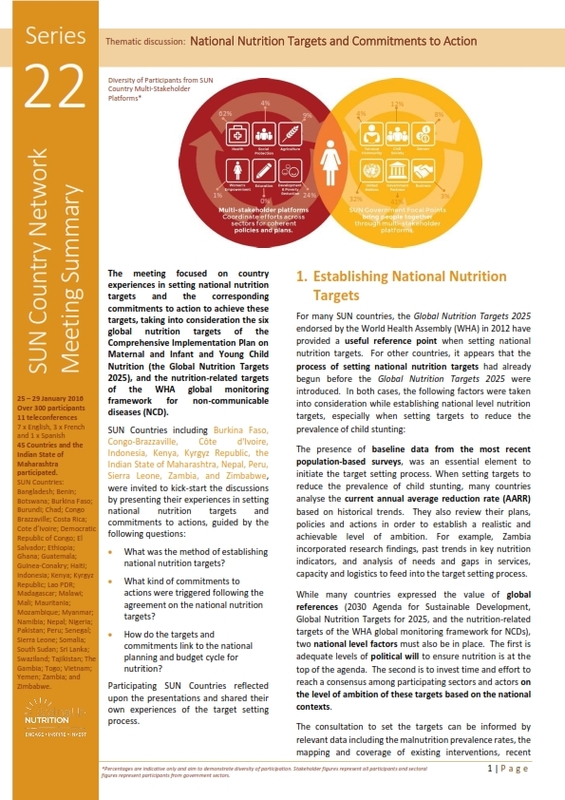 SUN Countries are striving to achieve the World Health Organization targets for maternal, infant, and young child nutrition by 2025, in addition to relevant targets for preventing and controlling non-communicable diseases. These goals are at core of the International Conference on Nutrition 2 (ICN2) Framework for Action and are integral for achieving the Sustainable Development Goals (SDGs). Over the past few years, international forums have been used to set targets and announce different commitments to end malnutrition. 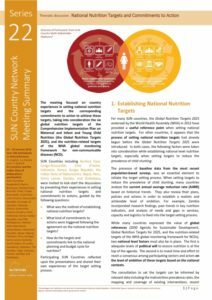 These global targets and commitments can help to advance national nutrition agendas by building awareness, igniting political will and informing comprehensive planning processes that identify concrete actions and resources to effectively translate commitments into results. The 22nd series of SUN Country Network meetings, discussions were focused on setting targets and making commitments and featured presentations by Burkina Faso, Congo Brazzaville, Côte d’Ivoire, Indonesia, Kenya, Kyrgyz Republic, Peru, Sierra Leone and Zambia. World Health Assembly A68/9 “Maternal, infant and young child nutrition: development of the core set of indicators” (15 May 2015).